Get more from your existing HPLC/Ion Chromatography system, with an AutoQuest Liquid Chromatography Autosampler. The Cecil AutoQuest, is that neat add-on to your existing LC system, which may be used with most third party HPLC and Ion Chromatography systems. It is ideal when your current autosampler needs replacement or if you have an increased workload. 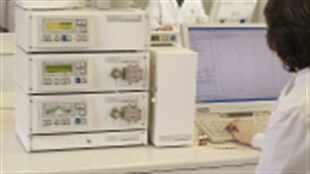 This autosampler is a handy, low maintenance addition in most chromatography laboratories. The astoundingly reliable 100 sample position autosampler, provides for ultra low carryover, ultra high injection precision, priority sampling, replicate injections and sample volumes from 5 µL to 2 mL. The ultra low carry-over provides for the ultimate in effective sampling for todays’ trace residue analysis and contaminant levels. With simple and reliable use via PC control or the stand-alone keys, and with easy third party connection and injection synchronisation, the AutoQuest will work together with your existing system. The AutoQuest autosampler also fits neatly within the Cecil Adept HPLC, Q-Adept HPLC, Merit HPLC and IonQuest Ion Chromatography modular systems. With the AutoQuest Autosampler, just set it up and leave it, to do its work.